Have you ever Copic colored on textured shimmer cardstock? 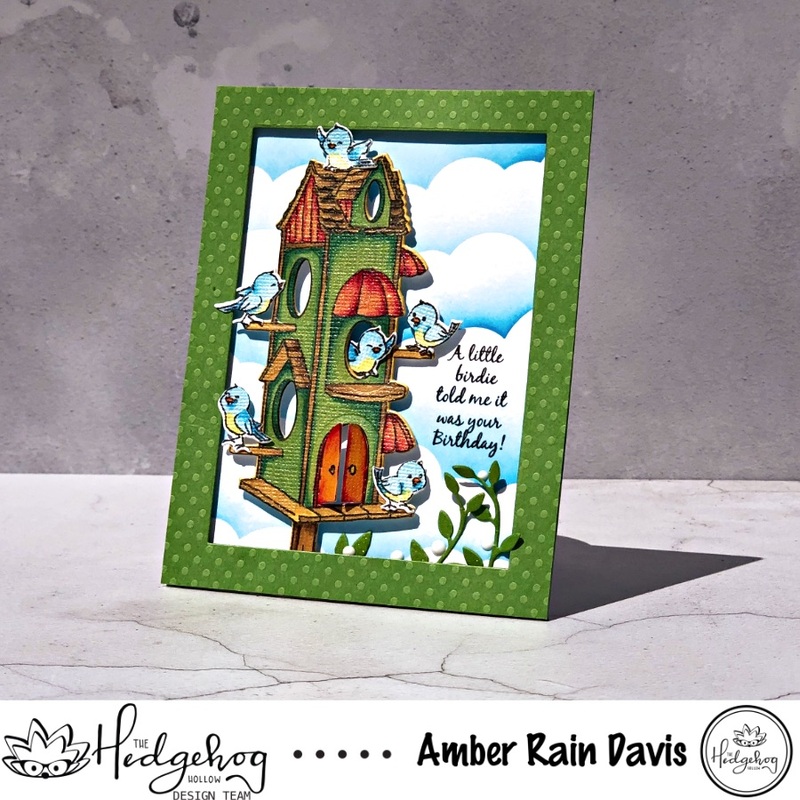 Read on for tips to color the adorable April 2019 Hedgehog Hollow Kit featuring Art Impressions Birdhouse Cubby stamps on yellow textured shimmer cardstock. I seem to be all about sparkle and alcohol markers these days, so when I saw the yummy buttercream textured shimmer cardstock in the Hedgehog Hollow April Kit I knew I needed to color it. Images will need to be stamped several times due to the texture of the paper, so a stamp positioner is highly recommended. Stamp the birdhouse on the yellow paper from the kit with Nuvo Hybrid Black Shadow Ink. This is an alcohol marker safe ink and is included in the kit. Blending is a breeze on this cardstock because the alcohol ink doesn’t absorb immediately due to the shimmer coating. You may find you don’t need as much ink or as many coats of color when using this paper. I had a piece of white textured shimmer cardstock in my stash so I stamped my little birdies on that so they’d be sparkly too. These guys are small, so keep your coloring simple and add shadows sparingly otherwise you risk bleeding. Using Salty Ocean Ranger Distress Ink and My Favorite Things Clouds Mix-Ables Stencil, I made a background panel. I created a frame by cutting a window out of the green dot paper with a rectangle die. 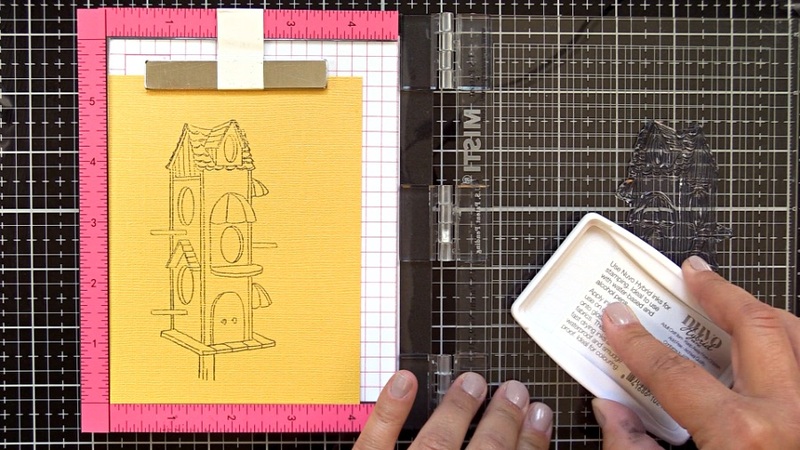 Pop up the frame, birdhouse, and birds with dimensional adhesive. Add Midas Touch Nuvo Aqua Shimmer Pen to all red & yellow areas and greenery. 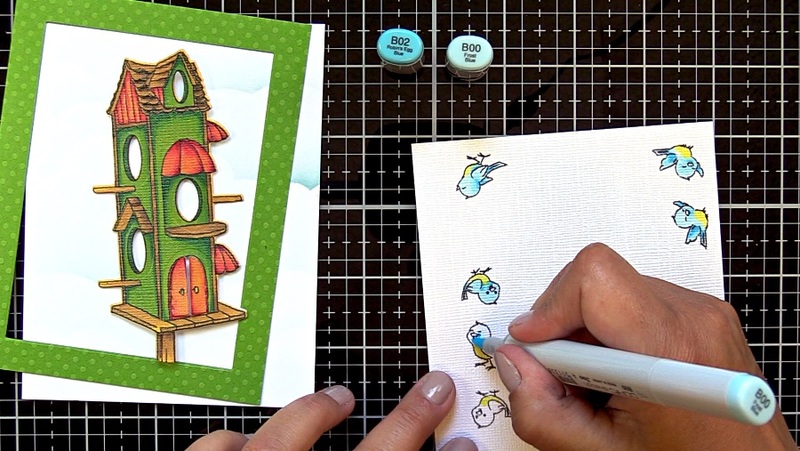 I hope you feel inspired to create with your April Birdhouse Cubby kit! Thanks so much for stopping by!